Simply elegant embroidered cards mix mediums of thread and paper. This collection of wishes features ten designs for two card sizes: 5 x 6⅞” and 4¼ x 5½”. For holidays, celebrations, and thinking-of-you occasions. After embroidery, add shadows of color with Kimberbell Watercolor Pencils, then use the blending brush to smooth the pencil lines into brushstrokes giving a wash of color on each design. To cover the back of the stitchwork, your CD includes printable inserts in both full-color and outline images. 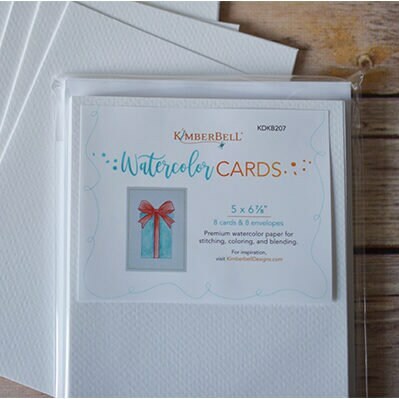 *Complete your cards with Kimberbell’s Premium Watercolor Cards (KDKB207 & KDKB208), and Watercolor Pencil Set (KDKB150).